Culture | In one of the halls of the Museum of Paleontology of Ukraine. Customers outside of the unique exhibits – the skeleton of a mammoth (found in the village. Gatnoe Kiev region, 12-15 million years ago). 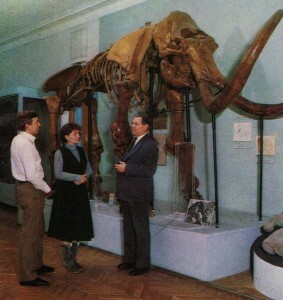 In one of the halls of the Museum of Paleontology of Ukraine. Customers outside of the unique exhibits – the skeleton of a mammoth (found in the village. Gatnoe Kiev region, 12-15 million years ago). Diorama “Cyril parking.” An exhibit of the Museum of History of Kyiv. Parking lot of the Stone Age (25-15 million years ago) in the territory of Kiev in the former St. Cyril Street (now Frunze Str. 59-61).A memorial plaque in honor of the founders of Kiev. Is set in a park of the VM Primakov in 1982. Sculptor VZ Boroday, architect, NM Feschenko. In a raised pedestal boat on a sculptural group of epic heroes – the brothers Kyi, cheek and Croatia, and their sister Swans. At the foot of the granite pedestal, is hosting the composition – the pool.